The La Hacienda Arriba BBQ chimenea is an ideal chimenea for those who want the flexibility of a chimenea and BBQ! It is also priced to sell and won't be in stock for long! 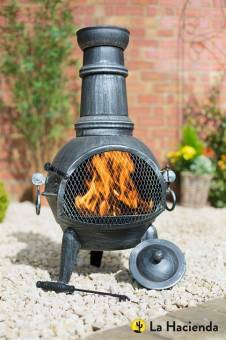 This wonderful chimenea is made from a mix of cast iron and steel and gives out a great deal of heat meaning you can enjoy the outdoors later into the evening. It also has the added bonus of coming with a BBQ grill!